These events are slowly evolving and bright. Thus they are relatively insensitive to cadence choices: all time scales are longer than days, all magnitudes bright enough to detect events within ~100Mpc. Relate color rather than spectra to physical parameters as we will have the chance to detect many of these transients too faint for spectroscopic followup: prediction on times scales and colors for example that can separate wind driven events from hydrodynamical mechanisms. two main families of NDET are identified: Massive Stars, T-Tauri Stars. Get complete statistics on LBVs: The rate of LBV is uncertain, due to their faintness. (absolute mag -8 to -15). They appear fainter with expected local extinction? That is easy with nearly any proposed cadence: the events last >10 days so each event will be discovered and sampled with at least a few points. predict the expected number of events: Can we assume we are complete for the past 20 years to Mag 17? We expect to be ableto detecttransients out to 25Mpc. A rough rate can be obtained assuming 50% completeness to mag 17. There are about 20 events till the early 2000s, there are 1000 galaxies in 25Mpc (650 or so spirals right) so that is gives me a rate of 0.001/galaxy/year. or a factor 10 fewer than the SN rate. This would suggest a sample of 100 LBVs can be constructed in the first year of LSST! Are we ready to do analysis on a statitical sample? LSST's main contribution will likely come from the identification of LBV progenitors in deep stacks. Relate massive starseruptions to SN precursors. Get statistics on precursor timeline and mass loss. This is really easy to accomplish with LSST: we will have a history of sky position for all SN and precursors are generally >10 days, so at least sampled by a few points. We generally use spectroscopic follow-up to distinguish different physical mechanisms and reduce the assumptions in deriving ejecta masses. Theoretical or data-driven work is needed to understand how much of this information can be extracted from colors. 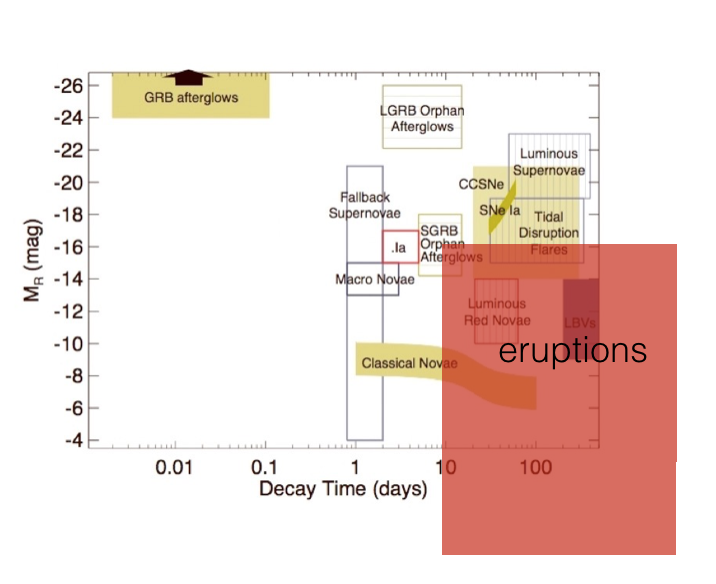 What are the duty cycles of outbursts of different accretion rates? 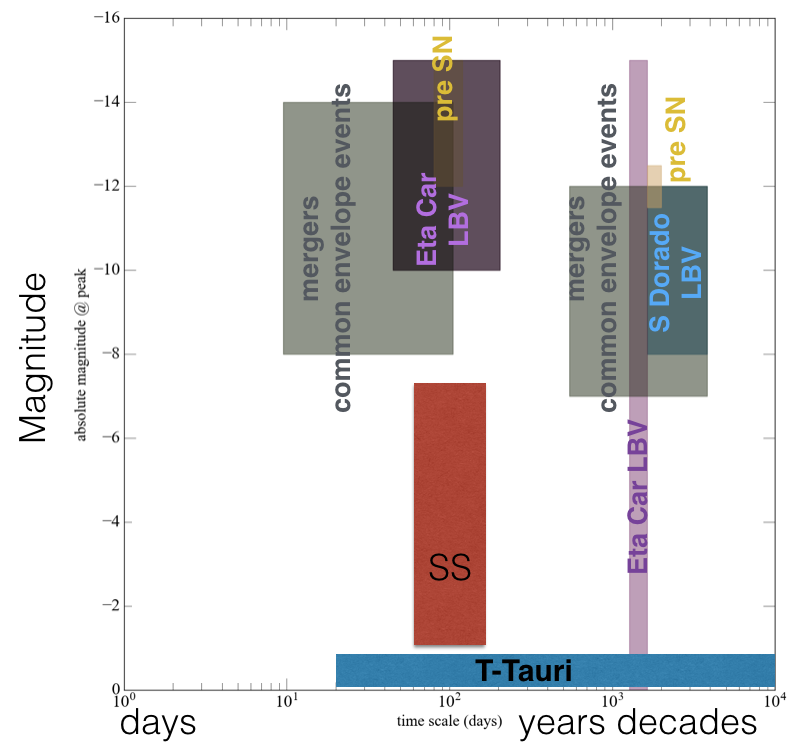 What fraction of the final stellar mass is accreted during these events? Spectroscopic follow up will be needed to accomplish this, thus LSST colors are helpful, but not needed from LSST directly. The main contribution of LSST will be finding the sources and the statistical analysis.The targets should be bright enough for followup from Chile with multi-wavelengths photometry, spectroscopy, and even take high-resolution images of the systems in the optical/near-IR (with VLT, Gemin, ELTs) and the (sub)millimeter (with ALMA). Additional phenomena: What is the roadmap between now anf the beginning of the LSST observations? LSST willprovide a statistical sample: they are diverse and rare. We really do not know what they are. Theoretical development, falsifiable predictions are needed. Can we discovery of Extrasolar KBs? Time scales are long, years for follow up: Bear+Soker 16 but this requires NIR follow up. Roadmap: Identify facilities that can do that, detection limits, relevant bands.